Before my 4-year-old randomly grabbed this easy reader at the library, I have to admit that I didn't know Wonder Woman's backstory. It's... interesting. You know, she's just your regular old Amazonian warrior princess turned top-secret government worker who fights crime with her magical lasso of truth. And talks to animals. And flies. So many questions were raised by the reading of this book. Why does she need an invisible jet if she can fly by herself? 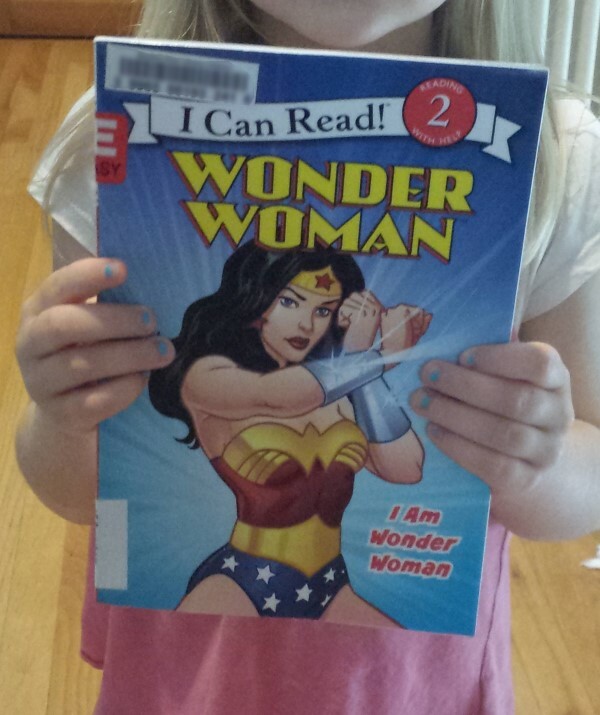 How does spinning turn her into Wonder Woman? And does it get annoying constantly hitching up her costume so it doesn't fall down when she's saving the world? I was procrastinating doing any real work researching for this post and found out that there's a Wonder Woman movie coming out next year. I also found the intro theme for the '70s TV show, and there's pretty much no way it can be better than that. Since we're like quasi-vegetarians now (I still don't know how that happened, it's probably a phase,) I decided to just go off the deep end entirely and make veggie burgers. I've never eaten one in my life but there's a first time for everything. 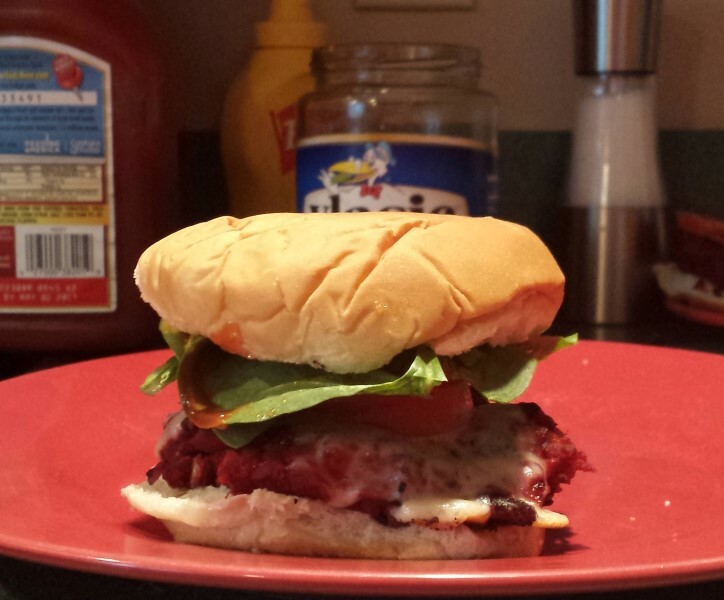 And the recipe was called "Best-Ever Veggie Burgers." So. Can't argue with that. I started prepping things a day early, because they were so much work. I was in my kitchen roasting beets and running them over a box grater, you guys. But by then I was in too deep to listen to reason and quit. "It says 'salt to taste' but I don't want to put this in my mouth." "There is no way this is going to taste good." Despite our lack of faith in the process, the finished product was... okay. It didn't really taste like anything, actually. It was the texture we didn't like. They just sort of fell apart when you bit into them. When you take into account how long they took to make, I'd say they were the least worth it thing I've ever done. But that's not all the weird stuff I've been doing in the kitchen. I just made a batch of lactation cookies. But I've never tried lactation cookies, so I figured what could the harm be? Even if they don't work, I've still got cookies. Besides, they're medicinal cookies so that means I don't have to share them with anyone. We were looking over our health insurance statements and noticed that my 6-week postpartum checkup with my OB-GYN included a charge for "psychiatric." I had to think hard about what that could mean until I remembered that in the lobby before my appointment I filled out a 10-question true/false survey to screen me for postpartum depression. It took maybe 20 seconds to fill out. And that's what $7.50 of psychiatric services looks like. With it being summer vacation and everyone home all day long, the kids are getting a little too familiar with each other and using not-so-nice voices to speak with each other. So, problem-solvers that we are, we decided that we were going to put out a bar of soap in the entryway. Every time someone speaks unkindly, they have to go lick the soap. Our kids run the gamut in their reactions, from one who is so sure she never wants the soap that she turned into a saccharine-tongued princess overnight, to one who actually likes licking the soap and couldn't care less. I think overall, it's working though. Phillip's new cell phone through work is legit fancy. It's even got high-tech fingerprint recognition to unlock it, which we thought was so cool until Phillip got a cut on his thumb and couldn't get in. Chips, you're a loser snack for loser-y losers. 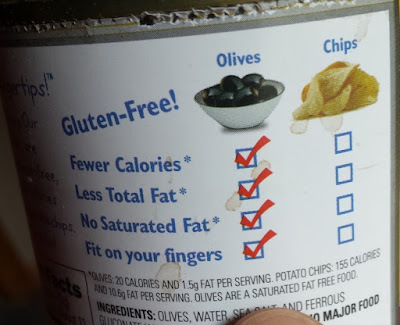 What I want to know is, why are they comparing olives and chips? I get that they're both snack foods... kiiiind of. But a direct comparison is a little bit of a stretch. But that reminds me, I need to go check the bag of baby carrots in the fridge to see whether they're healthier than Oreos; be right back. If they are going to charge for phyciatric, they better have a therapist there to listen to me complain for a while. I give my kids vinegar. I have had friends say their kids like it, but mine hate it, like think they are going to die type of hate it. I was concerned the quantity of soap my oldest was consuming could be bad for him so I switched to vinegar with much better results! He once ran to the bathroom and started pumping a bunch of foaming hand soap into his own mouth in an attempt to get out of the vinegar. HAHA! That olive can is hilarious. Okay, medical expenses can get ridiculous. I have a friend who is studying to be a doctor, and he said that the paper gown things that they are required to wear while in the room with a patient are $7 each! And sometimes they'll gown up and then the patient won't be there, so it's $7 in the trash. It's insane. That is ridiculous and it doesn't surprise me at all. I cringe when I get statements for a doctor's appointment where the doctor was literally in the room for 30 seconds, and I'm charged $400 for a "physician consult." These burgers had black beans in them, but lots of other stuff too. Yours sounds way easier! Well, that IS a shining endorsement for vinegar! I think the soap pretty well did it for my kids, we've only used it a few times and then stopped needing it for the most part (just the threat of it sitting on the table staring at them is enough.) But if it ever loses its power and we need something stronger... vinegar it is. I thought you were leaving the blogging world to go find yourself?! Anyway, glad that was quick. No one can compare olives and chips. The olive people are desperate. About as desperate as your family after trying those veggie burgers, it looks like! We tried about 6 weeks of eating healthier and I was pretty much burned at the stake in our house. I can still picture the disgust on my 13yo's face when I fed him whole-wheat tortillas. The horror! 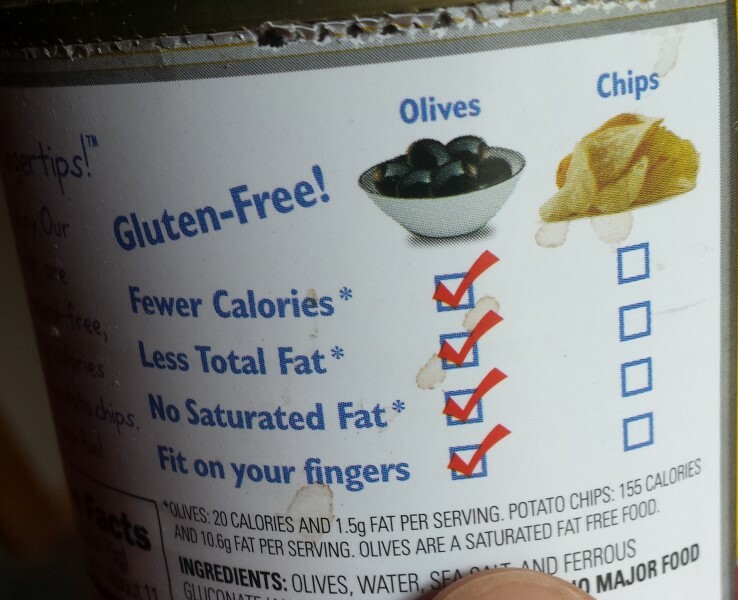 I like how "fit on your fingers" is a valid comparison that olives felt the need to bring up. Compared to the health facts listed before, it made me giggle. Lol, so glad I have you for comic relief!! You make life sound so much fun!! Very important! To my children, anyway. I remember getting soap in my mouth and then having to stand in the corner. I don't remember what I said, but I do remember using the curtains to clean off my tongue while I was standing there! Eh, I was. I did find myself, and I found I was a workaholic. So here I am. My favorite veggie burger recipe involves sweet potatoes, bbq sauce, and peanuts. Sounds atrocious but they're surprisingly delicious. That does sound a little gross. But perhaps not grosser than grated beets so it's worth a shot.